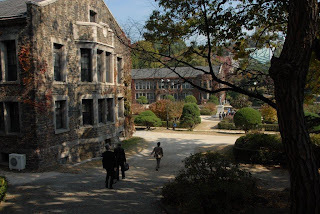 By now I had made two presentations, one at Kyung Hee University and the other at Yonsei University, but I still had two more to go. Although the content was to be generally the same, the venue would be the annual KAFF (Korean Architecture Fair & Festival) to be held at the CoEx Convention and Exhibition Center, the largest conference center in Korea. 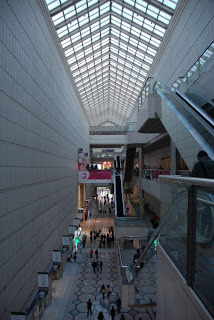 But CoEx is much more than that. 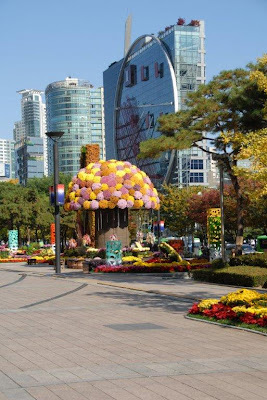 It is a business and cultural hub located in Gangnam, Seoul's business district, and includes Asia's largest underground mall, three five-star hotels including the one that I was staying at, two large office towers, the Hyundai Department store, a subway station and more. 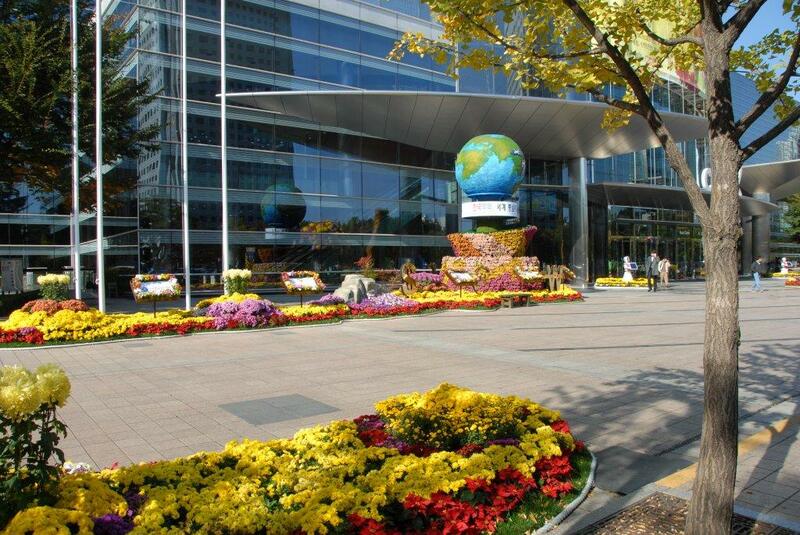 About 150,000 people visit this complex each day. 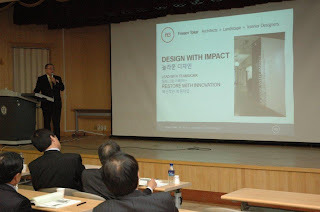 The seminars that Ken Klassen and I were to participate in had been approved by KIRA (Korea Institute of Registered Architects) for continuing education credits for its members. In preparation for the Friday seminar, we first met with Mr. Chi Tok Kim, a local architect involved in the organizing of KAFF. 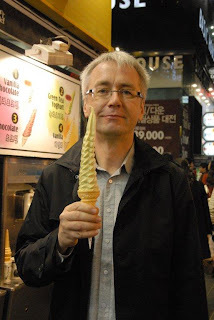 He is President of Yooshin Architects & Engineers, a 35 person firm. He was leaving the next morning for Sierra Leone where his firm is designing a new City Hall funded by the Korean Government. The early afternoon session consisted of my presentation, "Designing Multi-Unit Seniors Housing, Independent Living to Long Term Care, The Canadian Experience" followed by Ken Klassen's presentation, "Designing for Better Occupant Health, Comfort and Energy Efficiency in Seniors Housing." 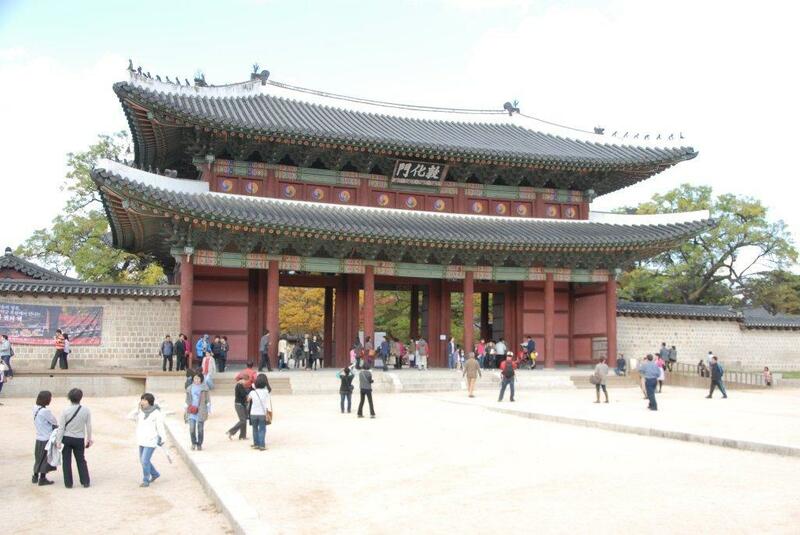 Sequential translation was provided by Julie Kim, a very competent translator from the Hankuk University of Foreign Studies. After our presentations we took a stroll through the Trade Show associated with this event. It was interesting to note the numerous references to LEED, with several local firms offering LEED related services. 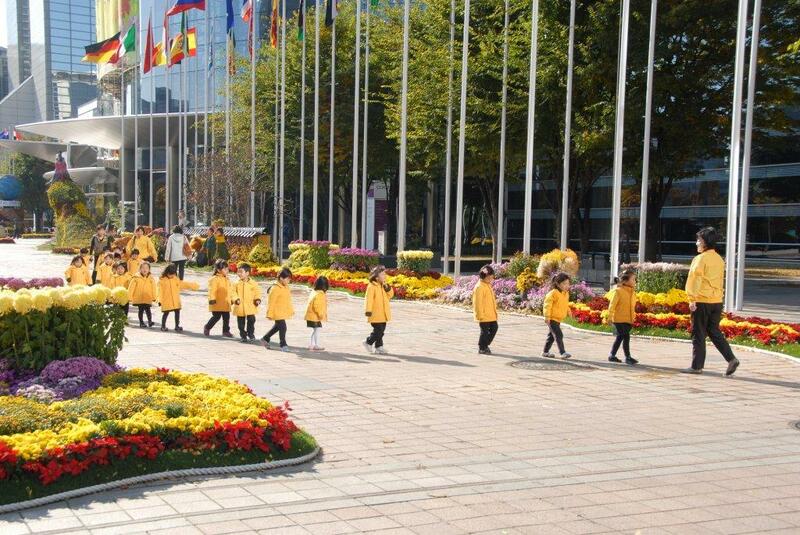 This confirmed for us that LEED is establishing a foothold in Korea. Other exhibits that I found interesting included the Canada Wood exhibit and the display of a large window cleaning machine that can run up the face of high rise buildings. On Saturday the Canada Wood Korea-FPAC Wood Frame Construction Seminar took place. It was an all afternoon session with an attendance of over 300, the highest number ever for this kind of event. Simultaneous translation was provided. The first presentation, "Using Wood in Green Building Design" was made by Isabelle Des Chenes, Vice-President, Market Relations and Communications, Forest Products Association of Canada. FPAC promotes sustainable forest management practices. It has 22 member companies and is based in Ottawa. Ken Klassen followed with, "Net Zero Energy in Wood Frame Housing, Canada's EQuilibrium Initiative." I then made my last presentation, "The Design of Multi-Unit Wood Frame Seniors Housing." The final presentation was made by Mr. Jae-Seung Song, Michoo Architects & Planners, a local architect with considerable experience in designing wood frame buildings. With that the formal part of my agenda for this trip was completed. I did have the opportunity to see some of the sites of Seoul as well. 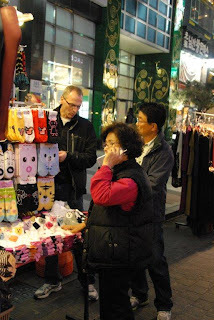 Friday evening, for example, Mr. JayWan Yu took Glen Webb, Ken Klassen and myself to the Namdaemun Market, the largest outdoor market in Seoul. It was a considerable subway ride from the hotel, which in itself was interesting. The subway system in Seoul is extensive with 12 lines and more under construction. It is the largest one that I have seen. It is well used. The majority of the riders spend their time on their phones, texting, playing games or watching TV. 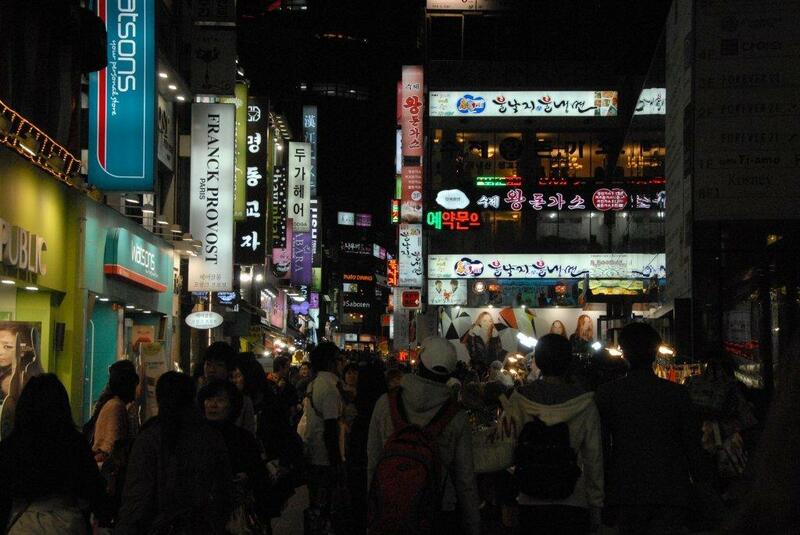 Seoul has the fastest Internet service anywhere. The sights, sounds, and aromas of the market were also fascinating. Mr. Yu (see first blog photo), a local businessman with strong ties to Canada, was very generous with his time, accompanying us throughout the week. He also translated the contents of one of my presentations. I spent Sunday, my last full day in Seoul, touring the City on my own. Highlights included seeing ChangDeokgung, one of the many large palaces, the Jogyesa Buddhist temple, and Bukchon Hanok Village, a neighborhood of 600 year old Korean wood houses with their decorative exterior walls, sweeping pagoda style roofs, and infloor heating systems (Seoul was almost totally destroyed during the Korean War so there are almost no historic buildings left). Dr. Yeunsook Lee, Professor, Housing & Interior Design Dept., Yonsei University and President of KIEAE (Korea Institute of Ecological Architecture and Environment), one of the host organizations of the Fourth Korea-Canada Technical Seminar held at Yonsei University), had invited me to join her for dinner to discuss seniors housing and community development. She described some of the initiatives she is implementing that give people a voice in the development of their own communities. She also questioned whether seniors should be housed in separate buildings. Since she had not been able to attend my presentation on designing for seniors, I described the workshop process that we implement on our projects whereby all stakeholders including members of the community have a say in the design. I also commented on the current thinking in Canada and the US about seniors housing, the Elder-Centric Village concept that I had referred to in my presentation which is to design communities around elders, integrating them into those communities. We agreed to continue this exchange of information and discussed the possibility of future cooperation. 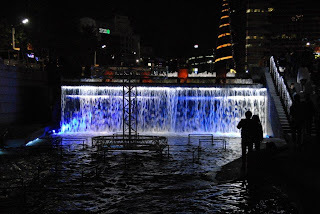 As we were leaving the restaurant she asked if I had seen the Cheonggyecheon Stream, a creek in the downtown area that was filled in some time ago and has recently been excavated and developed into a beautiful walkway. I had not, and since the starting point of this development was close by I decided to have a look. 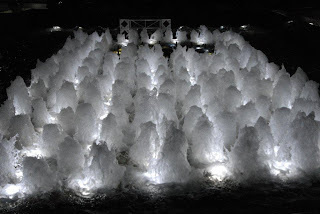 I was really impressed and ended up following it for an hour or more, admiring the variety of experiences that its design provides, watching the many young people enjoying it (there are a lot of young people in Seoul), and taking photos of some of its features. It is absolutely delightful, something I look forward to sharing with the landscape architects in our office. What a great way to end my visit to Seoul. Thursday was another busy day. In the morning I was invited to a meeting with Mr. Ian Yoo, Executive Director of the Korea Sustainable Building Council. Glen Webb and Ken Klassen also attended. 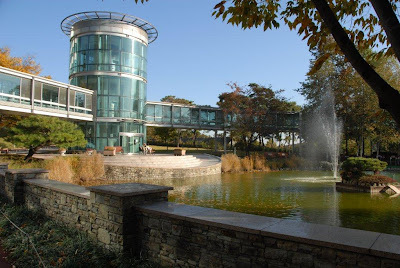 KSBC is in the process of amalgamating with the Korea Green Building Council even though the memberships of these two organizations are quite different, those of one being primarily academics, those of the other being practicing professionals. Each organization has a membership of approximately 200. This was an opportunity to discuss various aspects of this merger and to chat more generally about green buildings and various systems of measuring sustainability as well as about the growing need for seniors housing in Korea. 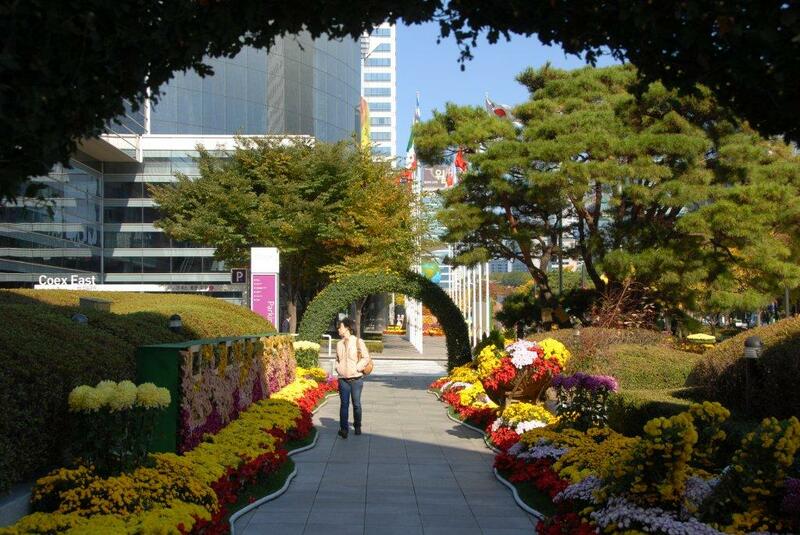 Mr. Yoo noted that there is a huge opportunity for green buildings in Korea among builders and developers. Because the current economic situation is not very good and because the cost of land is so very high, very few new buildings are being built. 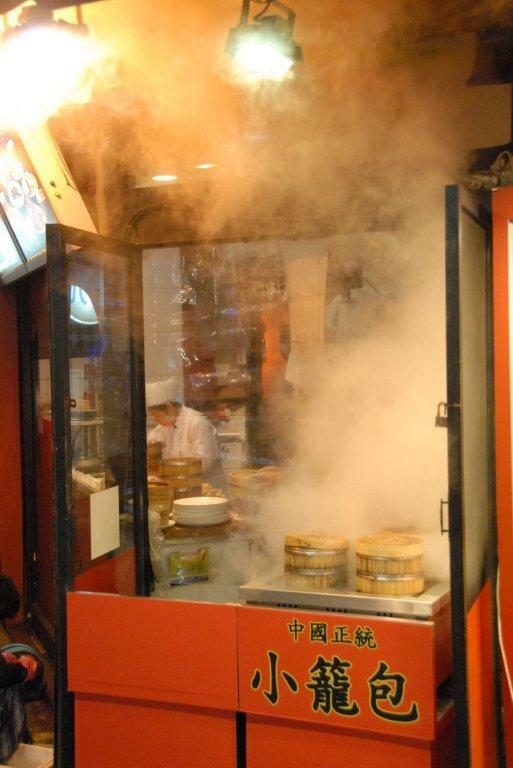 Instead there is a strong market for remodeling and retrofitting existing buildings and growing interest in making these existing buildings more energy efficient. LEED is becoming known and, in fact, the large corporations such as Samsung and Hyundai are using LEED, as are the larger architectural firms. It is popular in high-end office buildings and is now beginning to be implemented in school, kindergarten, commercial and residential projects. There are currently 100 registered projects, 10 certified projects, and 400 LEED Accredited Professionals in Korea, which is not a lot for a country of 50 million people. 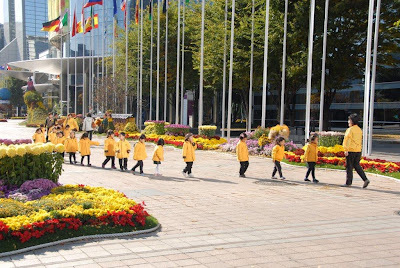 The Korean Government has its own system of measuring the sustainability of buildings which includes incentives, but it appears not to be very popular. It is also aiming for 100% net 0 buildings by 2025. We advised Mr. Yoo of the shortcomings and inefficiencies of LEED based on our experience but also stressed that the implementation of LEED in the USA and Canada has made a huge difference in the attitudes of people, governments and corporations toward sustainability and the environment. We, therefore, encouraged him and his colleagues to promote LEED and to call on us if there is anything we can help them with. One possibility that Ken Klassen has suggested is to have the Manitoba Chapter, under the leadership of ft3 partner, Marten Duhoux, advise them about the process it went through to create a directory of environmentally sustainable products. 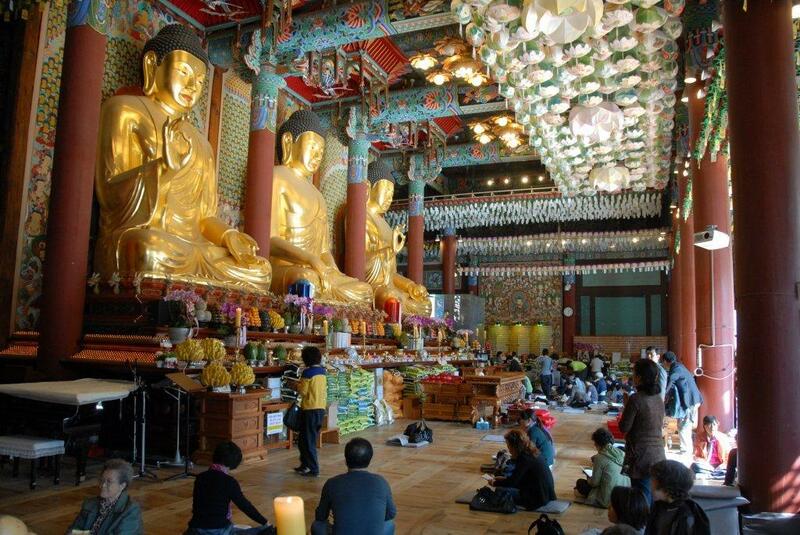 Mr. Yoo also commented on other initiatives underway in Korea. A number of cities have pro-green programs including Seoul and Kwangju, Korea’s 4th largest city which has an MOU with San Francisco to develop green programs. 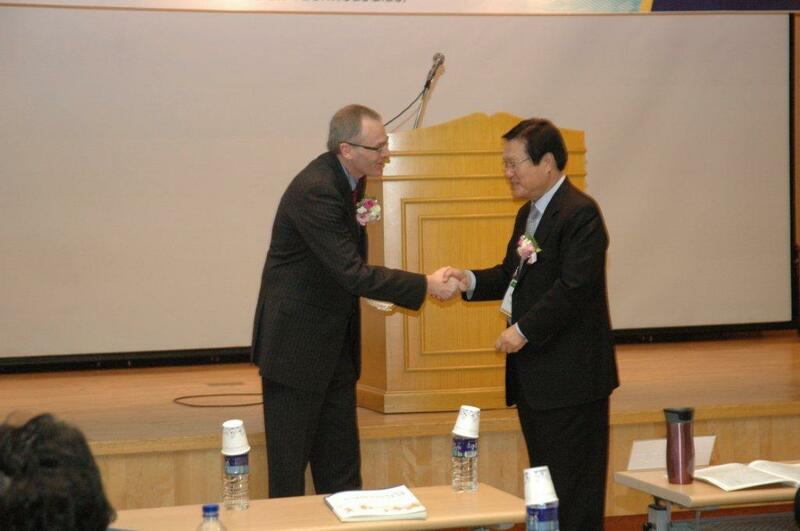 Also, a group of Korean professors has an MOU with the Passivhaus group in Germany. The Fourth Korea-Canada Technical Seminar took place on Thursday afternoon at Yonsei University, a private university founded in 1885 by an American Presbyterian missionary. It is one of the best in Korea. The theme for this seminar was established by Professor Kyung Hoi Lee, who is President of KRIEA (Korean Research Institute of Eco-environmental Architecture), as “State of the Art Green Seniors Housing and Passive Design Technologies.” Professor Lee is also Professor Emeritus and an Honorary Fellow of the American Institute Architects. The latter gave us something in common and we soon developed a good rapport. 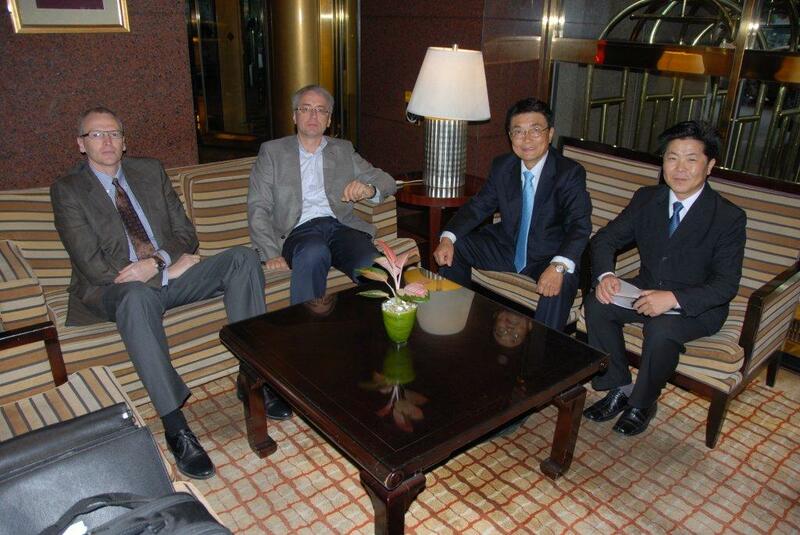 Upon arrival at the University, Professor Lee took us to meet the Provost, Dr. Il Sun Yang, for tea and gift exchange. She presented each of us with a University tie and a beautiful handcrafted Korean game. Opening formalities for the seminar included welcoming speeches and a special presentation to Glen Webb, Senior Trade Consultant with CMHC International, honouring his efforts towards Korea/Canada relations and the sharing of technical information between the two countries. There were four technical presentations. Dr. Shin-Young Park, with whom I toured the seniors facilities with on Wednesday, was the first presenter and provided an overview of the current status of seniors and seniors housing in Korea. My presentation was entitled, “Designing Multi-Unit Seniors Housing, Independent Living to Long Term Care, The Canadian Experience.” Ken Klassen, Consultant with CMHC Inernational Training Team, presented, “Designing for Better Occupant Health, Comfort and Energy Efficiency in Seniors Housing.” The final speaker was a local architect, Mr. Jong-Il Kim, MA Architects & Engineers, who spoke on “A Case Study of Zero Energy House in Korea” which focused on what he called the E-plus House. A panel discussion and Q&A followed. 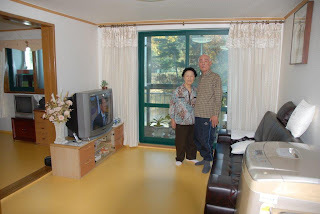 One of the main concerns in Korea is seniors housing for the middle class. Developers construct facilities for the wealthy but are not interested in doing the same for the middle class because it is not as profitable. There are no government incentives available and very little history of non-profit organizations, such as service clubs or churches, getting involved in seniors housing. In this regard there was a lot of interest in my presentation. Rudy with Dr. Shin-Young Park wearing the scarf with maple leafs. After the seminar we were invited to attend a formal dinner. The dining room was some distance from where the seminar was held. I was invited to join Professor Lee in a large black chauffeur driven Equus (a well designed upscale car made by Hyundai and used largely as limousines in Korea). I must admit I felt like a senior statesman. Dinner consisted of Korean food accompanied with a modest amount of wine. Because of the origins of this university, drinks are limited to wine. I was pleased to see Dr. Shin-Young Park wearing the scarf that I gave her the previous day. My wife, Edith, purchased a number of Manitoba/Canada gifts for me to take along. 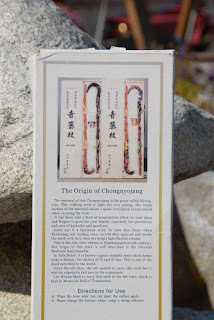 As an aside, I told Shin-Young and her colleague, Misook Lim, when I gave them the gifts on Wednesday, that my wife had not only purchased the gifts but had also selected the wrapping paper and wrapped them all. Misook was so impressed she came to this seminar with presents for both Edith and I. The dinner was a wonderful way to end the day, experiencing our hosts’ warmth and hospitality. I felt a real openness to developing and nurturing the kind of ongoing relationship that I was hoping for. 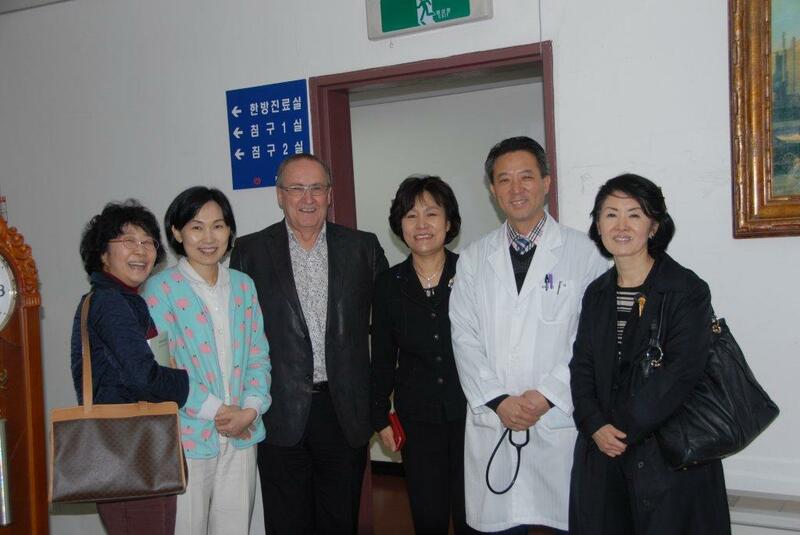 Today was the day for touring seniors facilities in Seoul area. Dr. Shin-Young Park (PhD in Public Administration), Executive Research Fellow, Korea Land & Housing Institute, picked me up at 8:30. 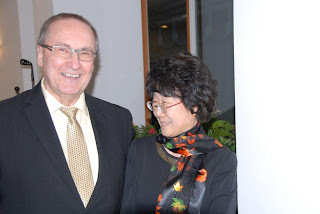 With her was her friend and colleague, Dr. Misook Lim (PhD in Architecture). 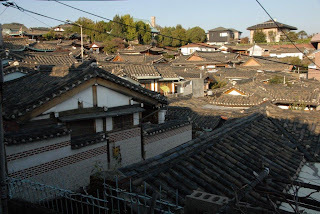 Our first destination was Pochun Silver Town, about a one hour drive northeast of Seoul and near a ski resort known as Bearstown. The name Silver Town is used in reference to seniors housing and no one seems to know why. But early seniors projects were not very well done, giving this name a negative connotation that has been difficult to overcome. The facility we visited was built in the late 1990s as a Silver Town. The first two developers went bankrupt. At the time less than 7% of the population were seniors. 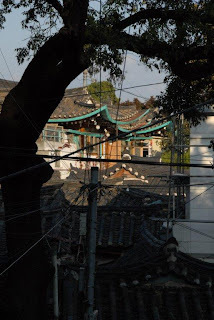 It was then taken over by a foundation that converted the first two floors of this 5 storey building into a rehab hospital for seniors providing physio and other therapies including oriental medicine such as acupuncture and moxibustion. 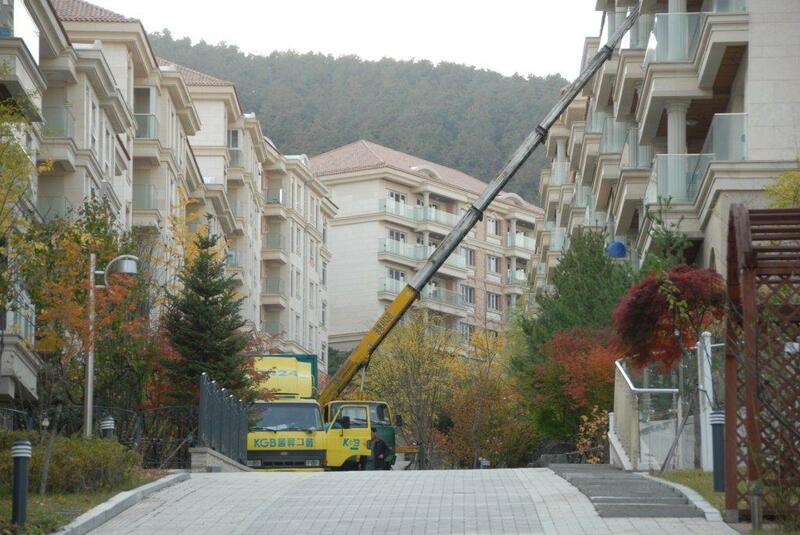 It also provides accommodation for elderly cancer patients. Floors 3, 5 and 6 still accommodate seniors in small one bedroom and studio apartments. In Korea the number 4 is considered unlucky so buildings tend not to have fourth floors, similar to Canada with our 13th floors. We visited three suites and were warmly welcomed by the occupants. One of the studio suites was home for an elderly gentleman who had been a lieutenant and was proud to have received a gold medal during the Korean War. Other than the fact that many of the residents sleep on mats rather than beds, these suites were not unlike some of the seniors homes built in Canada in the 60s. Amenities include a large multi-purpose room used for church services, theatre and lectures, a dining room and a large sauna building. A happy seniors couple in their modest suite, Pochun. 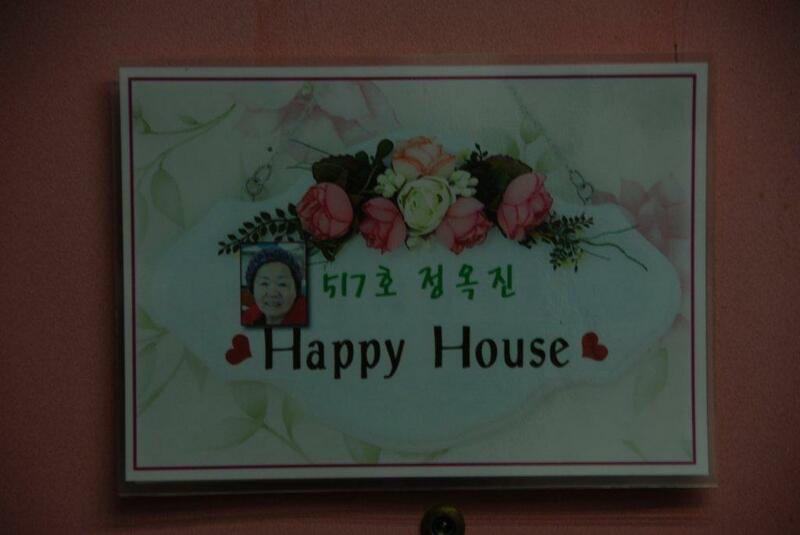 A sign on a suite entrance door, Pochun. 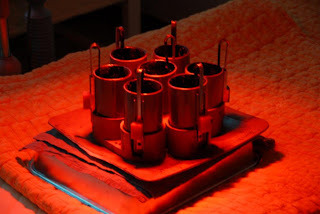 Moxibustion apparatus, a form of oriental medicine. 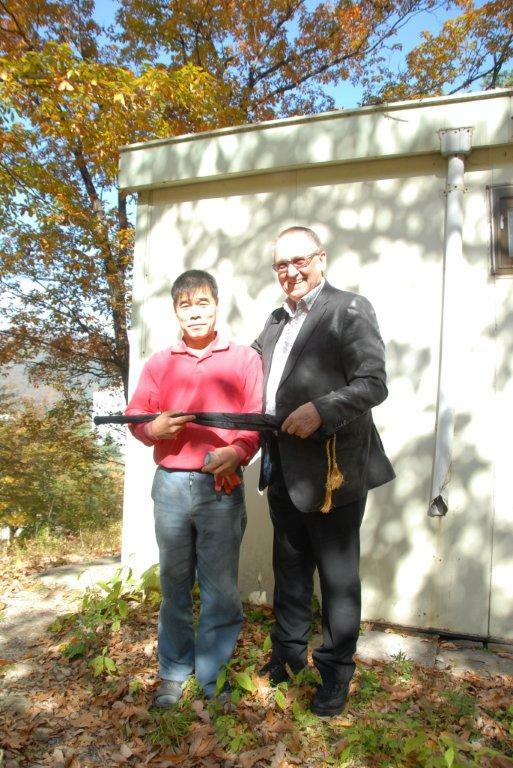 The Director of the facility, Mi-Ryung Hong, took us on a tour of the grounds. In a small workshop a young man was busy making canes from a fast growing shrub that is actually a grass. The handles are carved like the 12 animals of the oriental calendar. A display of finished canes included a fine looking one with a horse, which, based on my birth year, is my animal. Ms. Hong advised that as a display one it was not for sale and that if I wanted to buy one they would make one for me and mail it to me. After considerable negotiations I convinced her to sell me the display one and make the next one into a display one again. So I now have this great cane. Apparently it is a tradition here to present one of these canes to any one turning 100. I won’t need to wait that long to get one. Rudy with the cane maker. These canes are also a symbol of piety and Ms. Hong shared her vision of constructing a piety centre on the property, a place where Korean cultural piety will be promoted, something that she feels their society is losing. 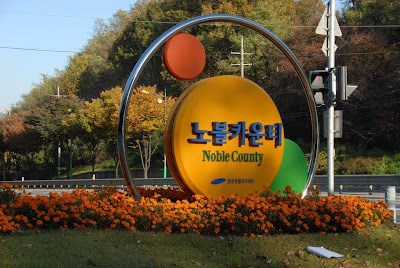 Koreans tend to be humble rather than pious, in my opinion, so the name of her proposed facility may have lost something in translation. Ms. Hong then took us to a nearby rustic restaurant for a traditional Korean meal. Korean restaurant where we had lunch. 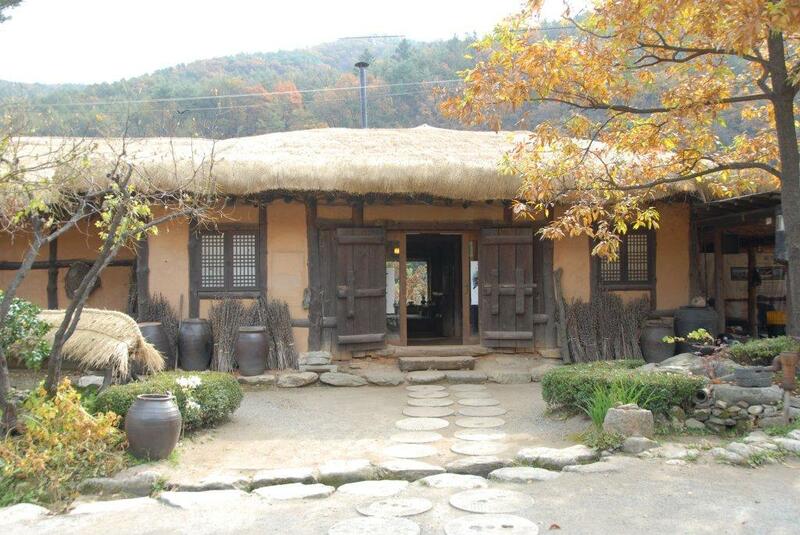 With our appetites appeased, we headed to our next appointment, to The Heritage, Classic & Joy, located in Bundang, about 30 km. 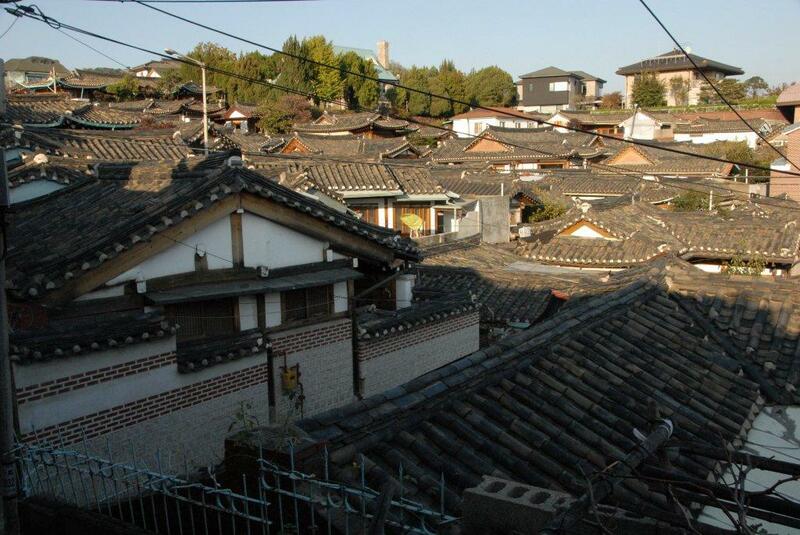 south of Seoul. What a contrast. 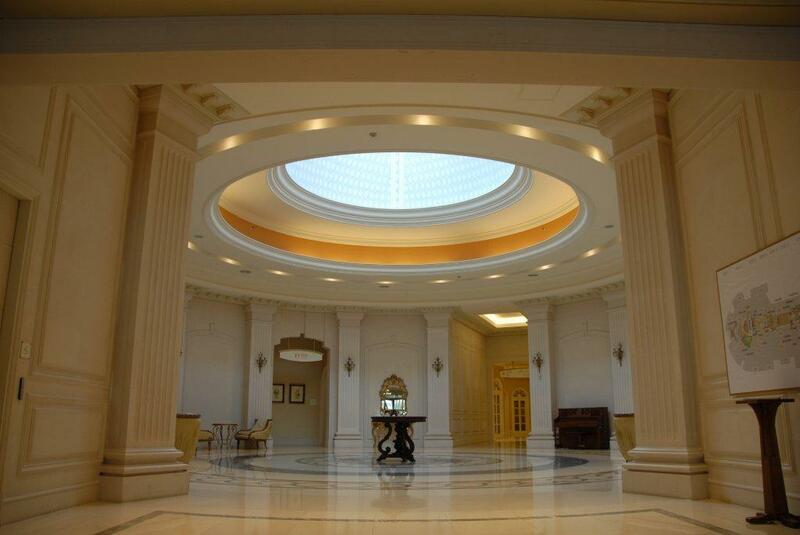 Built by SEOWOO, a healthcare and development company, this facility can only be described as opulent. To illustrate, it has approximately 14,000 sq.m. of marble flooring imported from Italy and carefully laid in intricate patterns. Units cost about $1.5 million plus significant monthly fees. 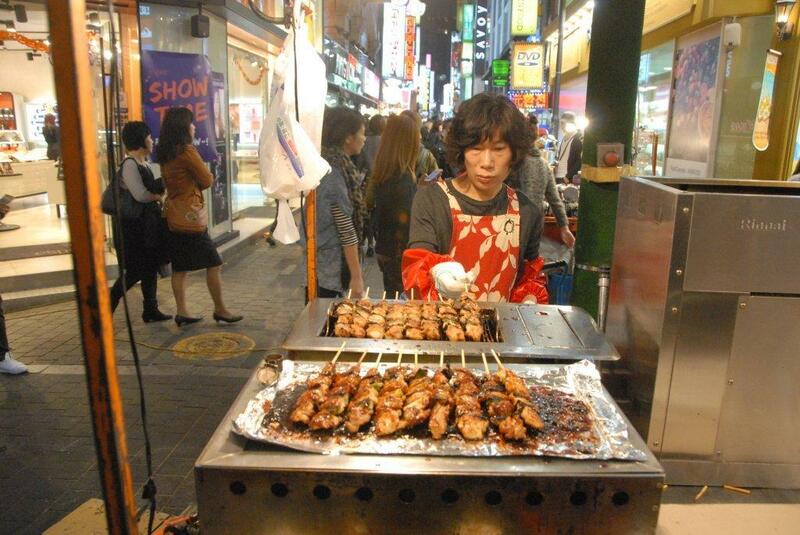 There are four restaurants where residents receive a 40% discount. The development includes 390 unit seniors complex , a 4 storey 235 bed nursing home and an adjacent 458 bed hospital, the Bobath Memorial Hospital which is owned by a British based foundation. Built on a hillside, the seniors complex has a central spine consisting of seven steps. 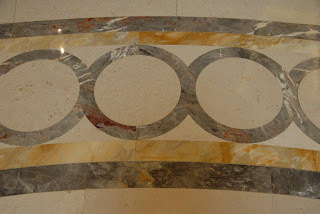 The steps are connected with a combination of escalators, elevators and even a stair with a handicap lift that one would normally find in retrofits. This spines contains extensive amenities from a large pool to golf training facility to theatre and a very large auditorium - clearly only for the very wealthy. The opulence at The Heritage. Plan showing the central spine, The Heritage. Golf practice area, The Heritage. 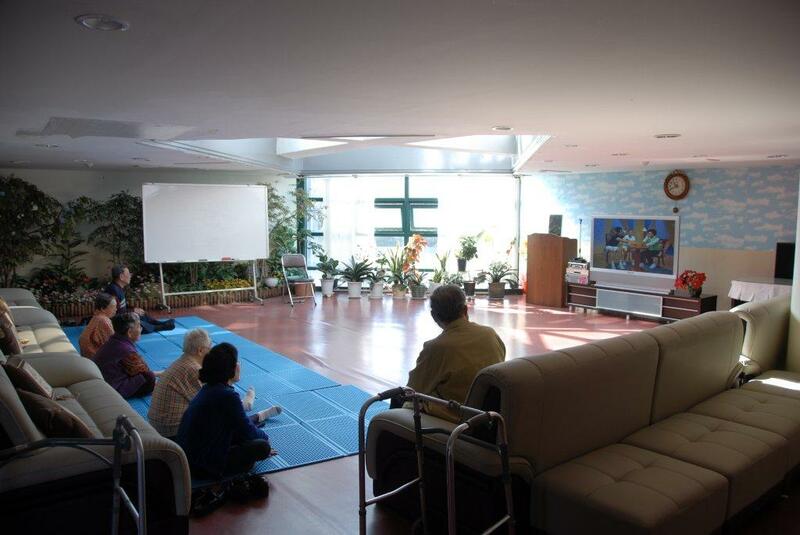 Our last stop was at the Seoul Seniors Tower, a 254 unit seniors facility. Suites range in size from 85 sq.m. 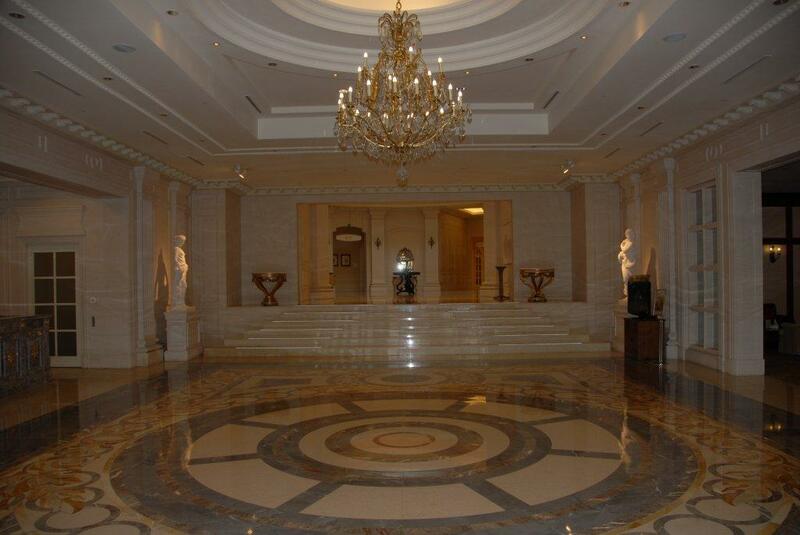 to 300 sq.m., 30% of the suites are rental, 70% owned. Fees are $1,500/month, not including rent, but including meals, cleaning and health services provided by a clinic on site. This clinic is open 24 hours and has a doctor, nurses and four physiotherapists on staff. 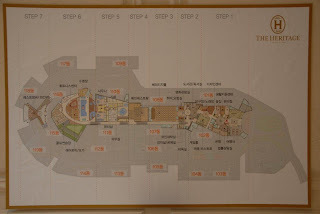 Also for the wealthy, this facility includes numerous amenities such as a large swimming pool, four hot tubs, auditorium, library, games room, etc. but is much more functionally laid out. 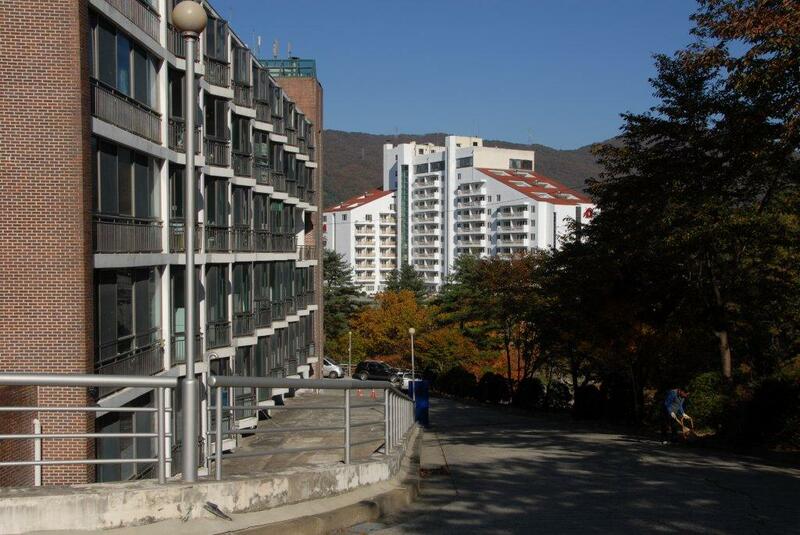 All of the suites are oriented to the south which is very important to Koreans. This results in single loaded corridors with windows on the corridor walls opposite the suites. 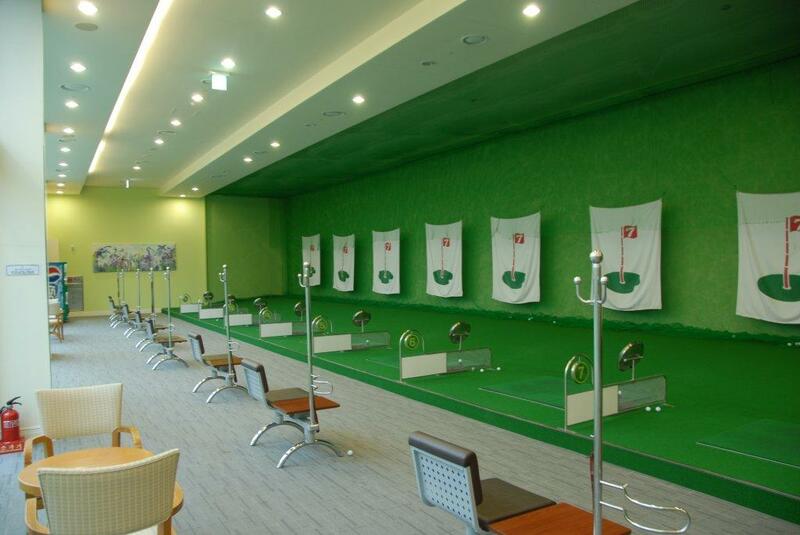 We were given a tour of the facility by Kyungeun Lee, who, it turns out, is the owner’s daughter. The father, Dr. Jong Kyun Lee, also owns a 140 bed nursing home and a 120 bed hospital that includes 60 nursing beds. 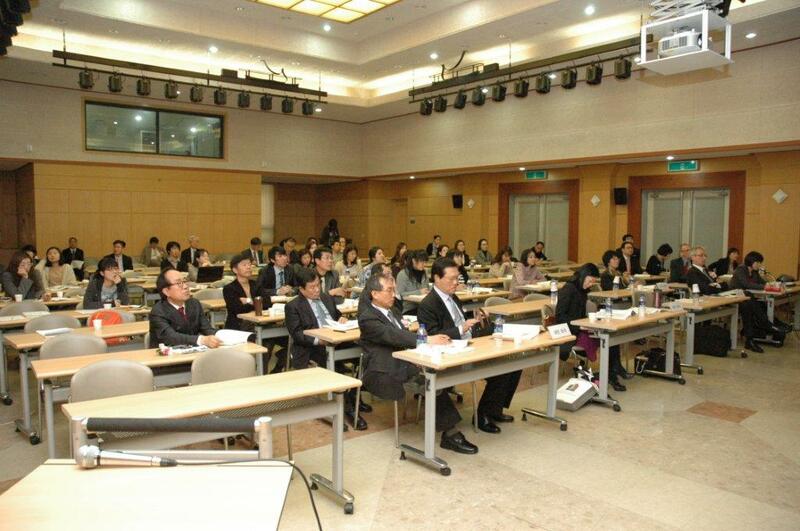 In Korea only medical doctors or doctors’ associations are allowed to own private hospitals. 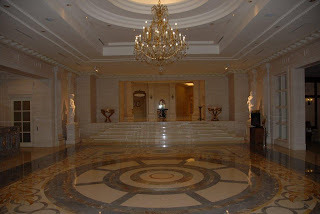 By 7 pm I was back at the hotel, tired but satisfied that I had learned a lot about seniors facilities in Korea. I presented small gifts of appreciation to both Shin-Young and Misook, my hosts for the day. It was an absolute delight spending the day with them. This is view from 24th floor of my hotel. 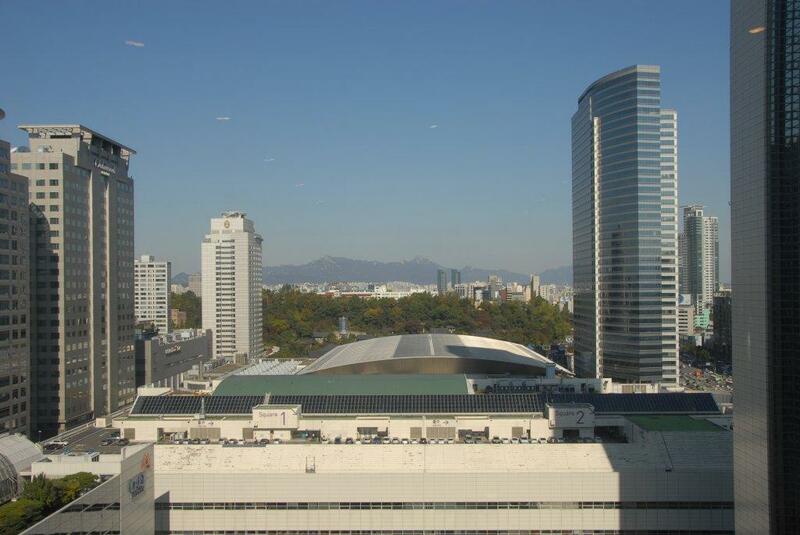 Today was a beautiful sunny day in Seoul, although cool and windy. I decided to take a quick walk after breakfast, rather than review my presentation for this afternoon one more time. I wanted to take some photos that I couldn’t take yesterday because it was so dark and dreary. The area around the hotel is very modern, as is most of Seoul, and I wanted to capture this. Next to my hotel, the Grand Intercontinental, is CoEx the largest convention centre in Korea. At the other end of CoEx is another Intercontinental Hotel. There are other major buildings adjacent including the World Trade Centre. 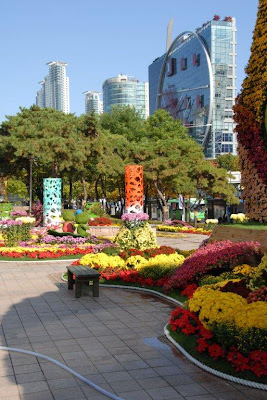 Following are a few photos that illustrate the character of the area, including some bold architecture and some that seems somewhat ‘over the top.’ There is also an amazing display of flowers in front of the CoEx complex that my camera just couldn’t resist. At 11:30 I was picked up by Jae Choi, who is QA and Program Coordinator for Canada Wood Korea. 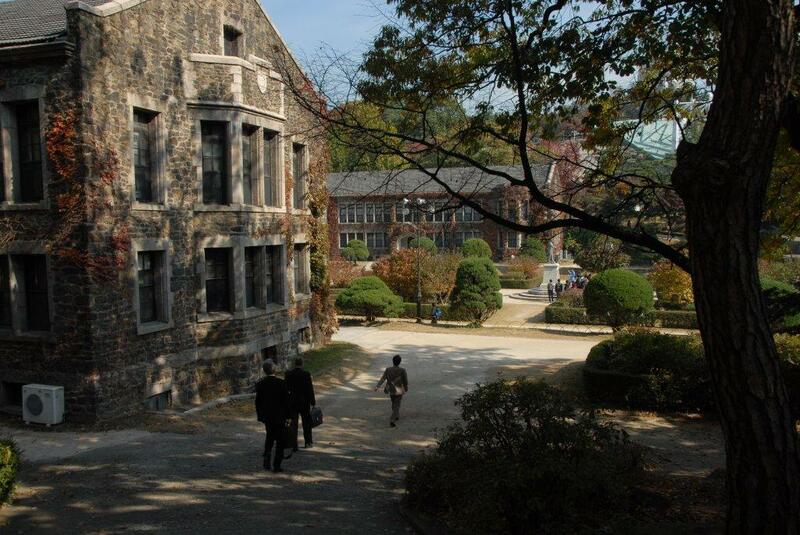 We headed out to the Kyung Hee University campus in Gyeonggi-Do, about 40 km south of Seoul. We joined Professors Kwansoo Kim (PhD, Harvard) and Ilhyum Kim (PhD, Venice) for a traditional Korean lunch which included miso soup and breaded whole fish (mackerel). Coincidentally the restaurant was located in a building that I thought was part of the University because of its institutional appearance, but turned out to be a luxury seniors facility built by Samsung. Although I didn’t have the opportunity to tour the facility, I did learn that its amenities include a swimming pool and gymnasium. 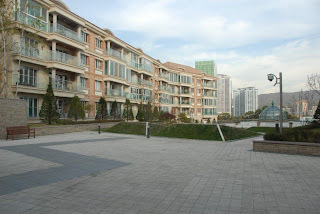 It advertises itself as a CCRC (Continuing Care Retirement Community) and appears to be a life lease project with refundable deposits of US$360,000 to US$450,000 required. Monthly fees are $2,300/month which includes 3 meals/day, healthcare, etc. (see http://www.samsungnc.com/). Two 20 storey towers include 540 Independent Living suites and 72 Assisted Living suites. 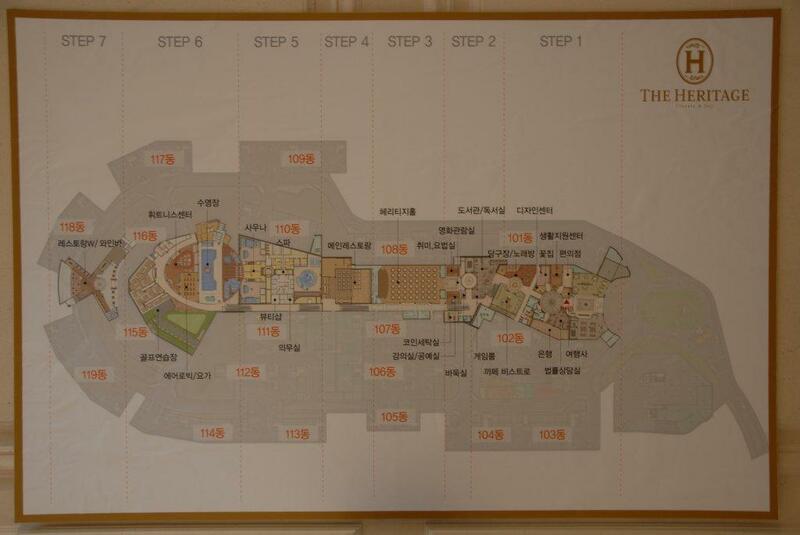 There is also a 120 bed Nursing Home and a Doctors’ Clinic. The grounds are beautifully developed. After lunch we returned to the University where I presented 'The Design of Multi-Unit Wood Frame Seniors Housing' to the architecture students. The technical nature of my presentation was a challenge for them and I sensed it. Fortunately, I had anticipated this and had arranged for a copy of 2010-2011 Wood Design Awards, prepared by Marianne Berube, Exec. Dir., Ontario WoodWorks, which I then showed them. The design quality of these winning projects was something they were able to relate to. 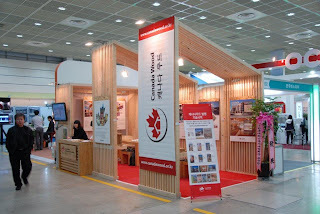 After my presentation, Professor Kim presented me with an honorarium, which I donated, in the name of ft3, to Canada Wood Korea, to be used as prize money for the next wood design competition to be held for the architecture students. It seems Professor Kwansoo Kim has become an advocate of wood buildings. Good Morning from Seoul, Korea. It's Monday morning here, the start of what surely will be an interesting week. Yesterday was a long day of travelling that actually spanned two days. It began early Saturday morning and included an 11 ½ hour flight from Vancouver that crossed the international dateline and a 1 ½ hour bus ride from the very modern Incheon Airport to downtown, a distance of about 70 km. Incheon opened in 2001 and is rated one of the busiest and best airports in the world. The sky was very hazy creating a surreal effect as we approached this city of over 10,000,000 people, over 25,000,000 in its metropolitan area. Why am I here? I will be making four presentations on our design experience with facilities for seniors, wood frame construction and sustainability. 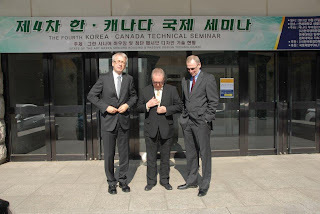 This was organized through the efforts of Glen Webb, Senior Consultant with CMHC International, who is responsible for promoting the export of Canadian products and services to Korea. Our hope is that this exposure will be the first step toward ft3 becoming involved in the growing seniors market here. The seniors population is expected to double in the next 15 years, to 10 million. And whereas traditionally the elderly were cared for by their children, this is changing. I thought that this journey may be of interest to you and so decided to share it this way. Hopefully you will find my blogs to be informative. We are excited to announce that we're finally launching our blog. It couldn't come at a better time: Rudy Friesen, one of our founding partners, has agreed to go to Korea for a conference on seniors housing and wood frame construction. He will be blogging and posting pictures as he travels. Be sure to check back often! Established in 1975, ft3 provides full architectural, landscape and interior design services for projects throughout Canada. With the Canadian Prairies as our primary market, we hold Certificates of Practice in Manitoba, Alberta, Saskatchewan and Ontario, with offices in Winnipeg and Calgary.